In a climate with cold winters, few words are more positive to describe a home than warm, cozy, and snug. Achieving these images requires the best heating system for the right conditions. Many choices are available, and two of these are baseboard heating and radiant floor heating 1. Baseboard heating is a hot trend for the coldest climates, providing a good choice for homes where the area experiences temperatures near or below freezing regularly. Radiant floor heating 1 warms cold feet and heats a room evenly, eliminating cold corners. In the sections below, we will discuss the features of these heating systems in order to help you decide which is better for your home. 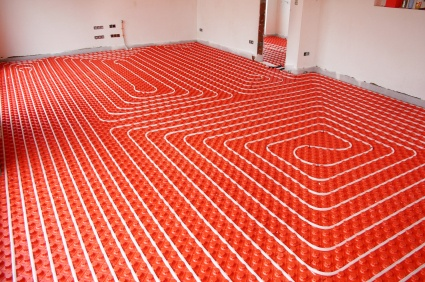 Radiant floor heating 1 systems come in two varieties: a boiler-based hydronic system and an electric coil system. The heat source for a hydronic radiant floor system is a boiler centrally located in the home. The heat the boiler produces is transferred to PEX tubing carrying hot water beneath the home’s flooring. If electric power is used, heating coils are located beneath the floor instead. Electric systems are best used as an add-on in a specific room or area, such as in a small bathroom or near a vanity, whereas hydronic systems are intended to heat an entire house. Because the coils or tubing are spread throughout the room under the floor, the room is more evenly heated. However, the radiant system makes heating a cold room a slower process. Once the heat rises from the floor, the room will remain warm longer than with baseboard heat. The heat in baseboard systems can be produced by a boiler or by electric elements in each baseboard unit. Baseboard units produce heat concentrated around the exterior walls of the home in order to provide a cushion of warm air between the frigid outdoors and the home’s interior. In order to maintain this warmth, baseboard heaters must be carefully spaced beneath each window and along exterior walls. Most baseboard systems are controlled by thermostats 2 in each room, allowing the homeowner to distribute heat only where it is needed. On the other hand, radiant floor systems are sometimes controlled by a central thermostat. A more expensive option can give control to each room. Radiant floor heating 1 system installations are expensive. Before beginning, a professional should determine if a home’s foundation and subfloors 3 will support the added weight. Radiant floor heating can’t be installed on existing flooring. This means that your flooring will need to be ripped up and replaced, making this type of improvement best when doing a full remodel of an existing home or building a new one. Installation costs of electric baseboard heaters are less than hot water baseboard heating or radiant floor heating since each heater only needs access to electrical wiring. Even though a heating unit is needed around each window, the installation cost is still less than any of the alternatives. A boiler-powered baseboard system is more expensive to install, but a retrofit installation of baseboard heaters is still less expensive and far less disruptive than radiant flooring because the existing floor covering can remain in place. Homeowners will also need to realize the limitations that baseboard heating can put on furniture placement. An underfloor 3 system lends itself better to creative furniture arrangements. You will have several considerations to make when choosing a flooring material to use with your radiant heat system. Non-insulating, man made floors such as tile or laminate will give you the best, most consistent heat. However, it is possible to use other materials like carpet or wood if you choose your flooring carefully. Choose a carpet with a high density, low R-value pad to help transmit the most heat, and install these rooms on a separate thermostat, as more energy will be required to heat the rooms through the carpeting. Look for very stable wood floors, such as engineered hardwood or quarter-sawn planks that are 3-inches or less in width to use with your radiant heat system. Because the heat may dry out the floor, using softwoods or wide planks may cause the floors to cup or buckle over time. You can use baseboard heaters with any type of flooring, including carpeting and hardwood, without worrying about the source. Radiant floor heating is a more expensive option because of the labor needed to install the system and ensure it is properly anchored to the existing subfloor. Further, the need for either a radiant x-block installed to your existing hot water heater or a full boiler system for larger projects will increase costs. A high-efficiency boiler system costs on average $4,000 along with a hot water heater or x-block that run between $1,000 and $3,000. The installation cost will vary depending on the amount of labor required. Expect to pay between $50 and $70 an hour for installation. On average, hydronic radiant heating systems cost between $6,000 and $14,000. If you’re installing an electric system in a small space like a bathroom, costs average around $700. Buying and installing electric baseboard heaters in a home will cost between $472 and $788 each for quality, long-lasting units. For a three-bedroom, 1,400-square-foot home with six windows, this makes the total between $3,500 and $5,500. The cost for a boiler-based system is more because of the cost of the boiler and piping, which are in addition to the individual units. A homeowner can expect to pay $6,000 to $8,000 for the same-sized home, including materials and installation. Because a boiler can be powered by a variety of sources, the homeowner can choose the most efficient fuel in the part of the country where the home is located. Also, a boiler-based system can be highly efficient depending on the type of boiler. A combination, condensing, or wood-burning boiler gives the best efficiency ratings. Heat rises from the floor in radiant floor systems, which means the lower part of the room where people reside is heated, allowing the residents to keep the thermostat lower. Scientific American quotes TLC’s Green Living Guide to say that this system is a better choice for a home with smaller rooms and lower ceilings. Its day-to-day efficiency may not compete with other types of heating in a large, open home. Baseboard heating is most effective in rooms with large windows in cold climates, but the cost of running an electric unit is much higher. Baseboard heating works most efficiently in spaces from 50 to 200 square feet. In addition, electric units will produce more heat, more quickly, which makes it a better choice if the homeowner wants to heat a room rapidly but not constantly. 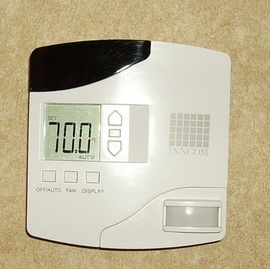 On the other hand, electric baseboard heaters turn on and off using a thermostat. Hot water baseboard units give a constant flow of warmth similar to radiant floor heating. Maintaining a hydronic radiant floor 1 system requires regular monitoring by a professional for the best results. Leaks between the boiler and an underfloor system are not common, but they can occur. If copper pipes are used, the leak can be repaired. However, steel pipes must be replaced. A thorough inspection of the system should be done yearly for older systems or every three years for newer systems. With regular professional maintenance, a system can last for several decades. Electric baseboard heaters, on the other hand, need very little maintenance beyond keeping them free of household dust. The better systems come with a 10-year warranty. Hot water baseboard units will need the same regular maintenance as hydronic radiant floor systems. Hydronic radiant floor heating may increase a home’s resale value. This should be carefully researched in your local real estate market, however, since the installation of a system is so expensive. The expense may not pay off when the home sells. Baseboard heating does not affect the resale value of the home. Radiant floor systems have the advantage of being completely silent. Historically, electric and hot water baseboard systems created unpleasant popping and humming noises, though modern higher-quality models are much quieter. Radiant floor systems and hydronic baseboard systems are the preferred choices for allergies since they are closed systems. No allergens or other irritants will be circulated during the heating cycle. 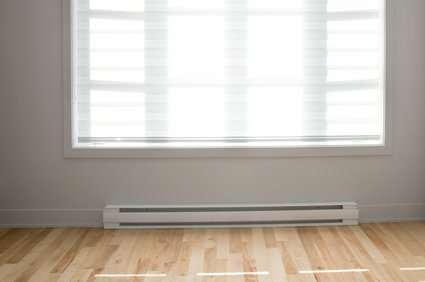 How much does it cost to install radiant floor or baseboard heating in my city? Cost to install radiant floor or baseboard heating varies greatly by region (and even by zip code). To get free estimates from local contractors, please indicate yours.